The RICOWI Board of Directors announced deployment of four teams to investigate the damage to roofs from Hurricane Michael in the Panama City, Florida area. This will be the sixth hurricane team deployment. The Wind Investigation Program (WIP) teams include wind engineers, roofing material specialists, insurance analysts, structural engineers, and consultants. The WIP mission is to investigate the field performance of roof assemblies after major wind storm events, factually describe roof assembly performance and modes of damage, and formally report results of investigations and damage modes for substantiated wind speeds. A report will be generated and made available online at www.ricowi.com. This program places experts in the field that have the required product knowledge and program training to ensure that sound, scientific and unbiased reporting occurs. The reports generated by RICOWI investigation teams are utilized to help educate all stakeholders and improve products, installation techniques, and safety. They are designed to help reduce overall roofing and insurance costs for the industry. The results will also provide a valuable resource to FEMA and state emergency management agencies. Prior to Hurricane Michael, RICOWI conducted five of the most comprehensive roofing investigations of hurricane-stricken areas: Hurricanes Charley (August 13, 2004), Ivan (September 16, 2004), Katrina (August 29, 2005) Ike (September 13, 2008), and a smaller investigation for Hurricane Irma (October 31, 2017). For additional information about RICOWI, or assisting with sponsorships of this research, contact RICOWI’s Executive Director, Joan Cook, by phone at 330-671-4569 or via email at jcook@ricowi.com. For more information, visit www.ricowi.com. The WIP mission is to investigate the field performance of roof assemblies after major wind storm events, factually describe roof assembly performance and modes of damage, and formally report results of investigations and damage modes for substantiated wind speeds. This Program places experts in the field that have the required product knowledge and program training to ensure that sound, scientific and unbiased reporting occurs. Buildings will be safer, property losses will be reduced and industry will meet the challenge with clear insight as to needed direction. The reports generated by RICOWI investigation teams are utilized to help educate, improve products, installation techniques, safety and reduce overall roofing and insurance costs for the industry. The results will also provide a valuable resource to FEMA and state emergency management agencies. RICOWI conducted five of the most comprehensive roofing investigations of hurricane stricken areas: Hurricanes Charley (Aug. 13/04), Ivan (Sept. 16/04), Katrina (Aug. 29/05) Ike (Sept. 13/08), and a smaller investigation for Hurricane Irma (Oct. 31/17). All research reports are available online as a download at www.ricowi.com. Table 1. 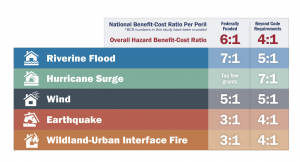 Benefit-cost ratio by hazard and mitigation measure. Courtesy of the National Institute of Building Sciences. More than a decade ago, the National Institute of Building Sciences (NIBS), a nonprofit mandated by Congress to improve building process and facility performance, issued a landmark report which changed the conversation about the value of resilience. The 2005 report, Natural Hazard Mitigation Saves, was authored by NIBS’ Multihazard Mitigation Council (MMC), which promotes collaboration to achieve resilience objectives among a broad spectrum of stakeholders. Working from data provided by the Federal Emergency Management Agency (FEMA), the report found that every $1 of natural hazard mitigation funded by the FEMA between 1993 and 2003 saved the American people an average of $4 in future losses. That one to four ratio of investment to returns was widely quoted at the time that the report was published, and has been cited repeatedly during the past decade as interest in resilience grown. This report was among the first to demonstrate that investment in mitigation could deliver significant returns. During the intervening years, as the frequency and severity of natural disasters has intensified, MMC leadership recognized the need to update and expand the 2005 study. Philip Schneider, AIA, Director of the MMC, explains that the “disaster landscape” has changed since 2005, necessitating a new report. “Our hazard maps, particularly, for earthquake and wind, have had several updates based on more research and better data. Our codes and standards are much improved for creating disaster resistance than they were over ten years ago. Our exposure to disasters, especially, building in disaster-prone areas, has increased substantially. We also have better methods for determining vulnerability to disasters than we had then, and more sophisticated economic analysis tools.’’ In fact, as part of the changed “disaster landscape” that Schneider references, 2017 set unwelcome records related to climate and weather events. According to a report released by the National Oceanic and Atmospheric Administration (NOAA) in early January, the U.S. experienced 16 separate billion-dollar disaster events, matching 2011 for the record number of billion-dollar disasters for an entire calendar year. Together, these events cost the country more than $300 billion dollars, a new annual record for the United States. While this data was released after the publication of the MMC report, it underscores the urgent need to lessen the financial impact of these increasingly frequent disasters. Figure 1. Total costs and benefits of 23 years of federal mitigation grants. Courtesy of the National Institute of Building Sciences. Figure 2. Total costs and benefits of new design to exceed 2015 I-Code requirements. Courtesy of the National Institute of Building Sciences. The study reports that when the cost each group bears to mitigate a loss is subtracted from the positive benefits it enjoys, the “net benefit” is positive in each category. In other words, the value of investing in mitigation is spread broadly across the construction business and the people it serves. 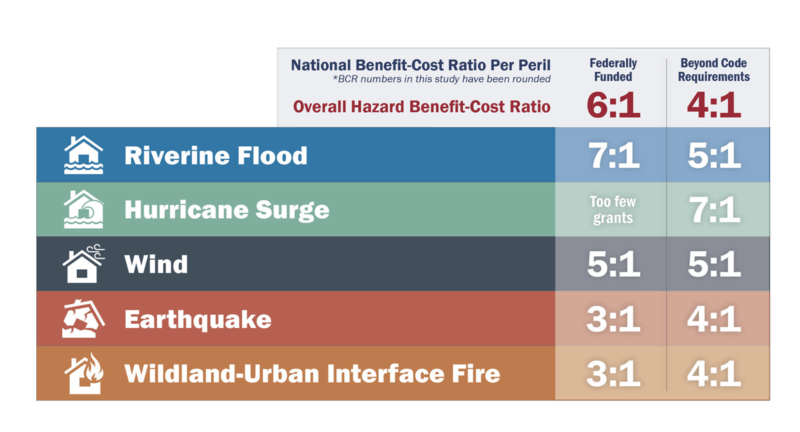 The authors of the report are careful to point out that the cited benefit-cost ratios, or BCRs, are generated from two very specific mitigation strategies: those used by FEMA, and those incorporating designs that exceed provisions of ICC codes. Noting that the results from the 2005 study represented only a single, very narrow set of strategies but were incorrectly used to justify “all types of mitigation strategies,” the authors of the study specifically say that they did not provide an aggregate number in the updated study, but elected to provide BCRs for the two strategies individually. Moving forward, providing an aggregate number is definitely one of their goals: “Once the project team has identified BCRs for a sufficient number of mitigation strategies, it will provide an aggregated number representing the overall benefit of mitigation.” To help achieve that goal, multiple studies are being conducted by the MCC to examine the value of many kinds of natural hazard mitigation at the national level, and more studies are being planned, pending the acquisition of funding. Coordination of risk mitigation and management improves between and among public, private, and non-profit sector entities. The private and nonprofit sectors increase their investments in and innovations related to mitigation. State, local, tribal and territorial governments are increasingly empowered to lead risk reduction activities and share responsibility and accountability with the federal government. Public, private, and nonprofit sector entities develop and share more of the data and tools needed to make risk-informed mitigation investments. Public, private, and nonprofit sector entities improve risk communication, leading to more risk-informed mitigation investments by individuals and communities. This Draft report is now available for comment and FEMA will continue to research the issue before releasing its final recommendations. This increasing focus on the issue of resilience has moved the debate forward, beyond where it was just a year ago at this time. The question is no longer whether resilience is needed; the daunting statistics of 2017 confirm that cataclysmic weather events are on the increase and can cause staggering damage to the built environment. The NIBS report provides hard evidence that resilience is an investment in the future that will pay dividends for years to come. The debate now moves forward to the best ways to finance these mitigation efforts, so that those future dividends can be realized.